In the beginning of 2017 Kaunas was chosen to be one of the European Culture Capitals in 2022. Kaunas? To be honest we´d never heard of this city until the Lithuanian Culture Institute invited us to visit it. Kaunas belongs next to Vilinius to the main cities of Lithuania. Long time ago Kaunas was the capital of that baltic country (which is Vilnius now). After our arriving we felt a good vibration through the city: High potential areas and spots and great chances to develop the place as a street art hot spot. 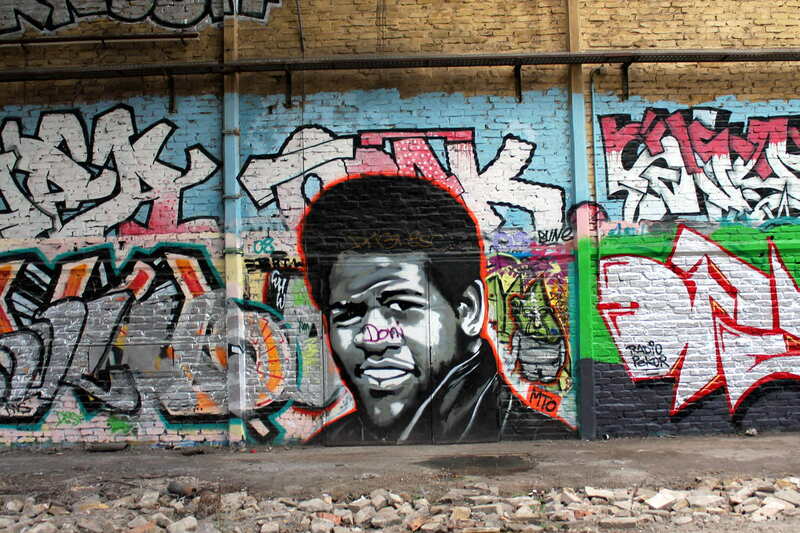 Because what we found was incredible: A lot of stunning murals all over the city. Halls of fame and curated super art pieces. Some of our favourites we would like to introduce here. The piece on top of this article is as big as 440m2 and named The Wise Old Man. 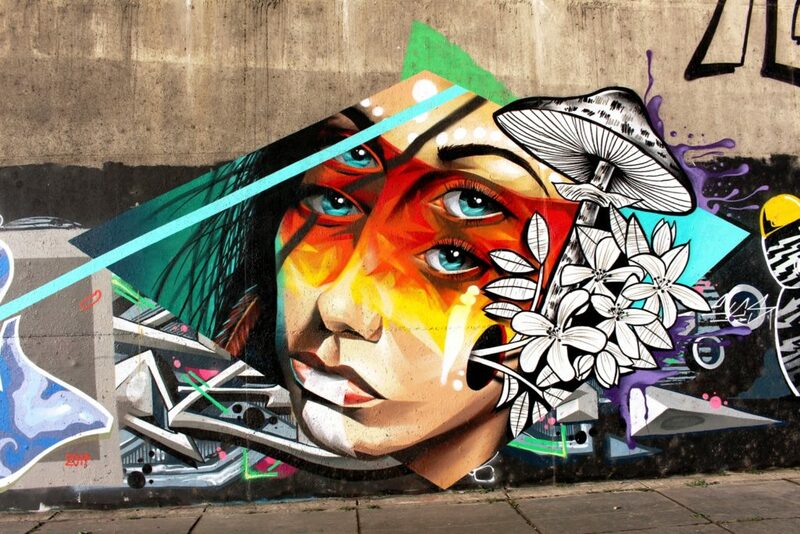 It was done by the duo Gyva Grafika in 2013. It is to find in Jonasvos Street 3. The mural on the façade of the abandoned Lituanica factory depicts an old man who smokes a cosmic pipe decorated with constellations. Both an old man and a pipe are the symbols of wisdom. 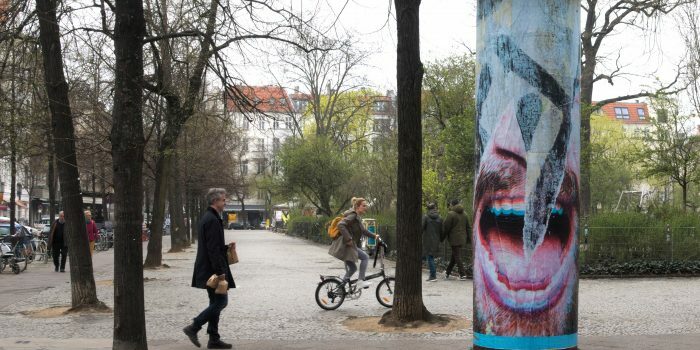 Located in one of the most active places of the city, this work attracts attention by its size and red colour; however, instead causing shock, it invites people to slow down, take a look around, listen and enjoy the moment. It is like a wish for a growing city to gain more wisdom. 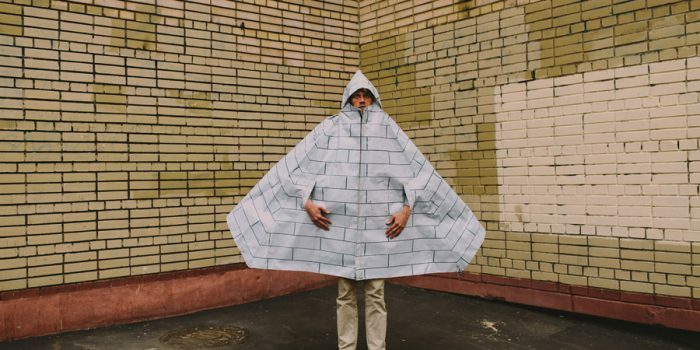 The pattern of the robe features pencils and paintbrushes, because this work has been initiated by and completed on a building that at a time served as a residency for Fluxus Ministerija art incubator. The old man’s bare feet serve as a tribute to the former function of the building which was used as a Lituanica shoe factory at some point in the past. An interesting fact that once the drawing was completed, it has been soon adopted by the city and become one of the symbols of its image. 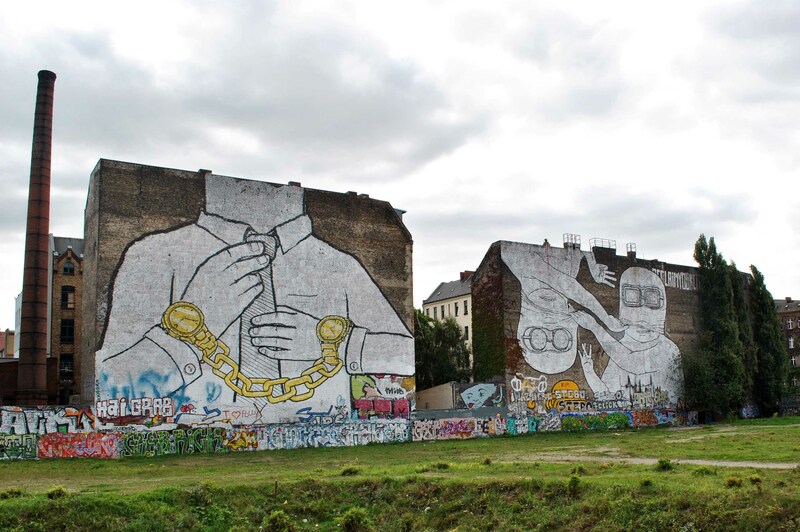 This mural was the first large-scale street art project in Lithuania, which contributed to the subsequent spread of street art and its recognition by Kaunas society. 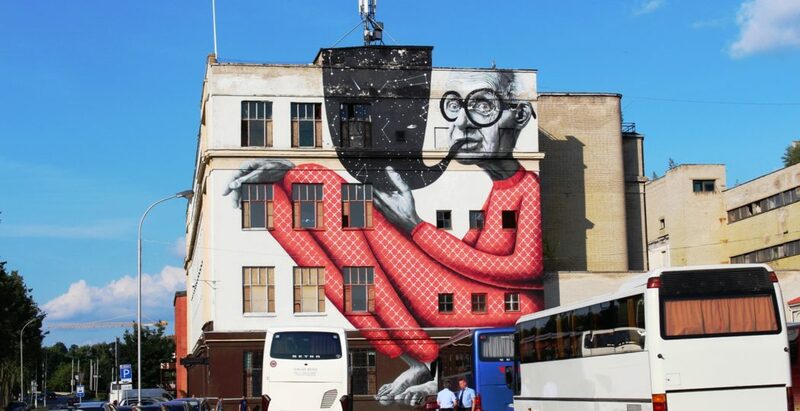 Inspired by positive reactions this mural evoked, Tadas Šimkus has started Kaunas Street Art Festival NYKOKA. The Gyva Grafika collective has been established in 2010, when two like-minded people started working in the field of interior and façade design. Žygimantas Amelynas and Tadas Šimkus who have completed their bachelor studies of Applied Graphics in VAA Kaunas Faculty are not afraid even of the largest formats. 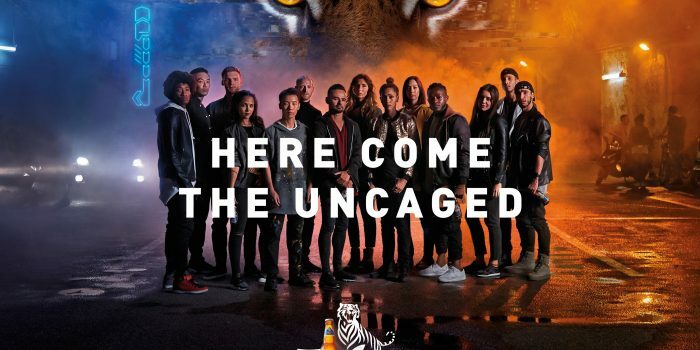 The aim of the duo is to channel solely positive emotions, avoid patronizing, even though occasionally they address relevant topics in their works. 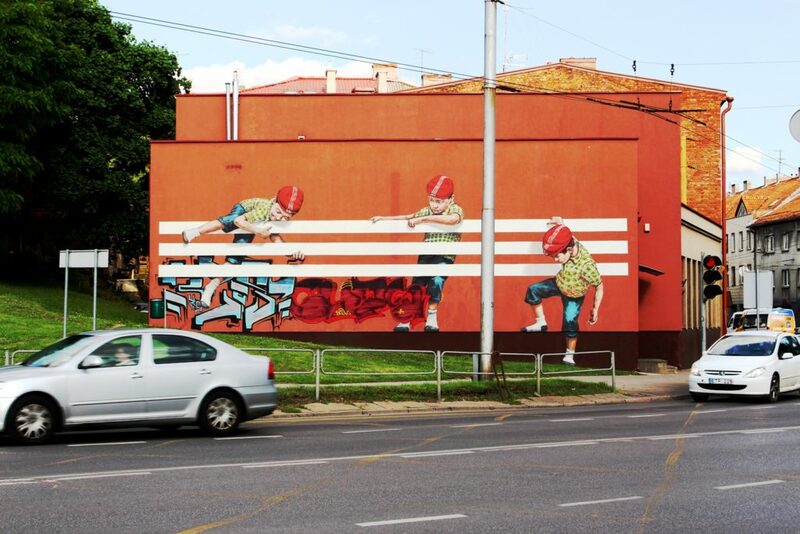 In order for the murals to fit in a certain space, the artists must sometimes change their style and take the surroundings into consideration; as a result, it may seem their projects have been carried out by different authors. In any case, the works of these authors are characterized as precise and recognized from the use of graphic elements. 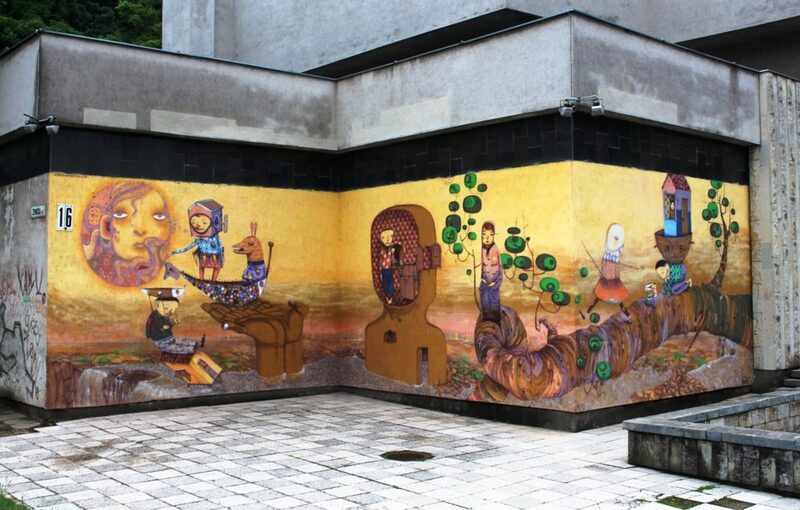 About the mural: As in most of the works by Ernestas, children are the main characters of the mural completed on the west façade of Kaunas Cultural Centre of Various. The work pictures three boys climbing and leaning over three white stripes that form an obstacle for them. As an author, Ernestas have not elaborated on the idea behind the mural. According to him, each person has its own interpretation regarding the subjects and names of his works and he likes to keep it that way. And what about the artist? Ernest Zacharevic, who goes by the name Zach, is currently living and working in Malaysia. Zach creates his works in different formats relying on the traditional painting technique, with occasional use of some other artistic means like sculpture, installation, stencils, etc. The artist experiments a lot. The truth is, the only constant thing in his work is a continuous change of ideas. Zach uses his works to establish a dialogue with the society so before starting a new project, he conducts an investigation of its environment, local residents, their customs and life-style; only then he produces his own interpretation of that place. Every city needs a great hall of fame. That´s why the Hall of Fame by the river was initiated in 2015 by Kaunas Street Art Festival NYKOKA. 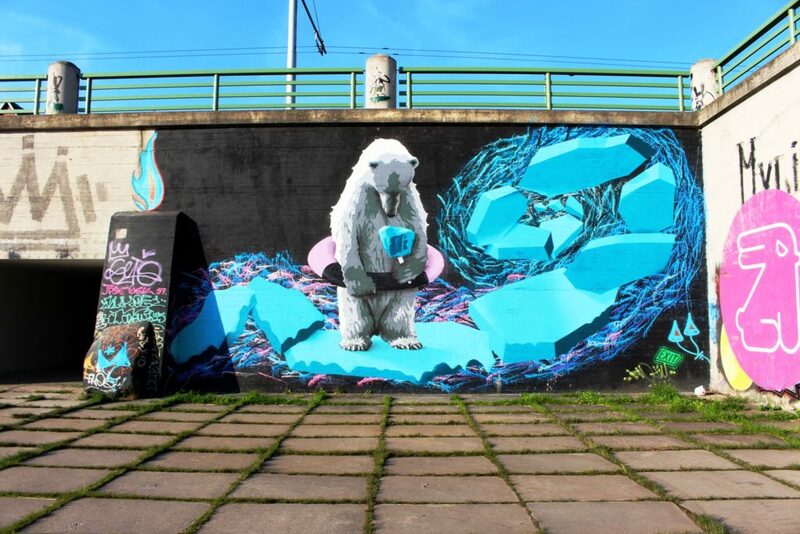 They took care of the legalisation of Nemunas Embankment next to M. K. Čiurlionis Bridge and it has become a favourite spot for graffiti and street artists. 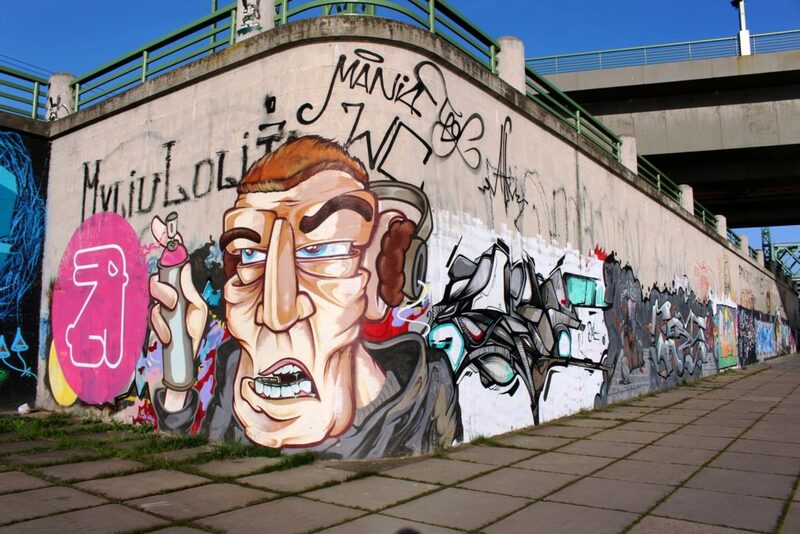 This place attracts both beginners and advanced artists; therefore, this is where you can see the most recent works by street artists in Kaunas city. It is currently the only open public space for art, where artists can create from 8.00 AM to 10.00 PM without any additional permits or written consents. If you think of legal walls and hall of fames in Germany then you know that there is always a strong change of the art pieces. In Kaunas it is not – at least not on every spot at the wall. And this fact makes it very interesting: In Kaunas is a silent agreement of the coexisting of the curated artwork by AFK and the free style areas. The Ice Diamond mural is done in 2015 by AFK, Teg and Benjamin Vinkel. You can find it at Karaliaus Mindaugo Ave. 64, Embankment of Nemunas River, next to the M. K. Čiurlionis Bridge. The mural portrays a white bear which stands on an ice floe, holding a piece of ice / diamond on a stick and looks at it with sadness. The authors selected such composition to raise the awareness about the global warming, since melting glaciers endanger white bears. Without a stable ground under their feet, these animals cannot hunt and are forced to starve for months until the water freezes again. Therefore, it seems that a simple piece of ice in the paws of a bear gains the value of diamonds. 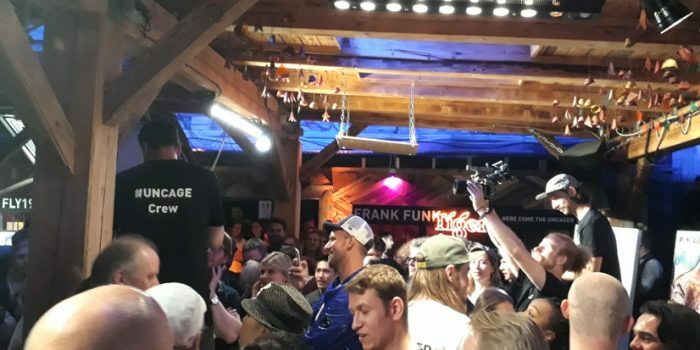 The crew who did it, is very interesting: there is AFK who does not want to reveal his nationality, Teg from Sweden and Benjamin Vinkel from Norway, who all live and work in the area of Bergen (Norway), which have become interested in an opportunity to complete a large-scale project in Lithuania. 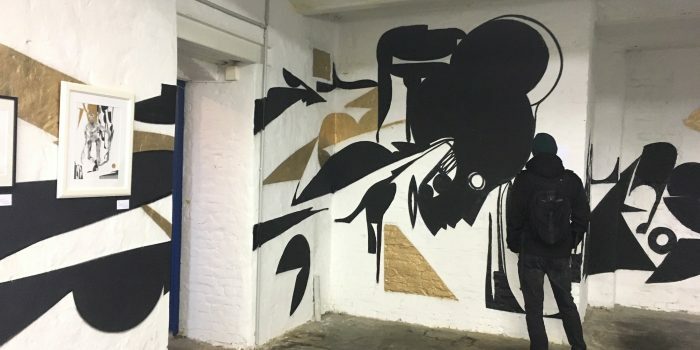 The artists who work with different techniques have joined their forces for a project in Kaunas: AFK is famous in Norway and around the world for his compelling stencils; Benjamin experiments with volumetric shapes, while Teg has perfected the technique of splashing and pouring. The work depicts two pigeons, her and him, which symbolize friendship and union. Based on a small format (10cm x 10cm) graphic stamp, this mural has been enriched by the elements of etching: rough outline, random lines and blotches. The background reminds of wallpaper ornaments and thus highlights the spirit of home comfort, while the colours selected for this work go together with the characteristic Tsarist Russian colouring of adjacent buildings. An interesting fact: one hundred years ago, at the beginning of the 20th century, there was a station of war pigeons next to this place, with birds delivering information in three different directions. During her studies in Vilnius Academy of Arts, Gražvyda had tried all traditional techniques of graphics; however, what fascinated her most was the opportunity introduced by the gravure graphics. She creates her works by incising a drawing on a metal plate and then printing it on a sheet of paper with a special printing press. As a professional graphic artist, Andrijauskaitė combines the techniques of etching, aquatint and dry point working. The artist has been active for 15 years already; she has been teaching art to children with special needs for the last three years. After so much input on street art and working artists in Kaunas, there is a need to take a ride to a famous international street art duo which left several pieces in Lituania……apropos ride! 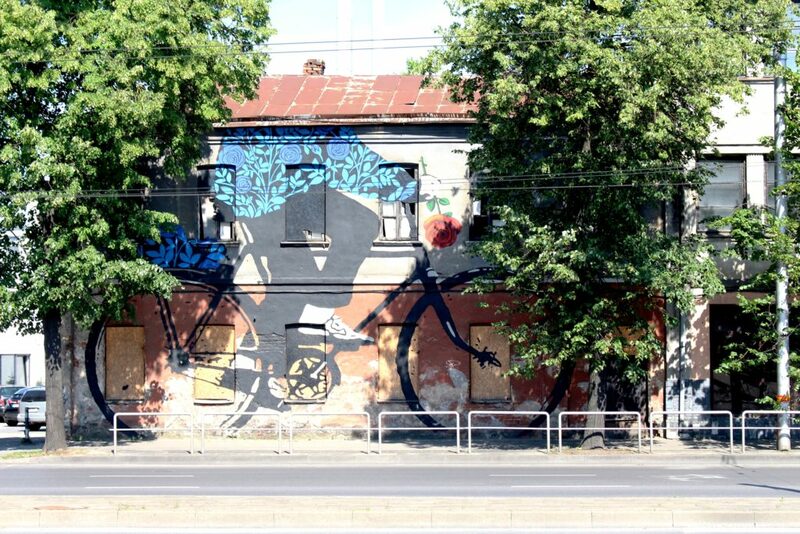 Of couse there is a fantastic piece you should not miss on your way: the bicyclist mural at the train station of Kaunas. The wall is designed to bring some romance into the controversial part of the city – the Station District. 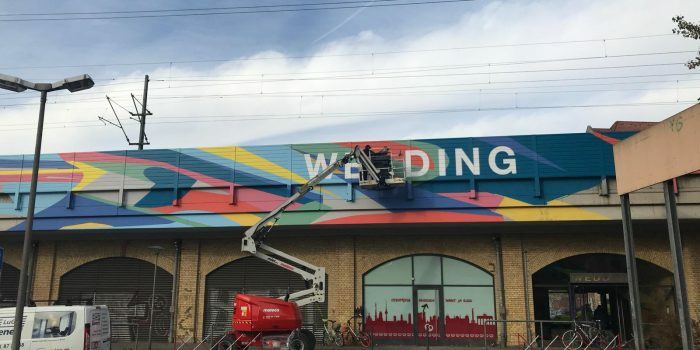 The choice of wall for this mural is no coincidence: it welcomes city guests and offers a great view from the railway station. This drawing serves as a camouflage for the old and crumbling wall: while the drawing and the wall remain unnoticed in the traffic, no one notices the ruins as well. A riding bicyclist is one of the characters frequently visible in the streets; therefore, it does not stand out too much and becomes an integral part of the everyday life of the district. The motif of the flower has been suggested by a nearby flower market. Where does the bicyclist go and who will receive the rose? This is for a passer-by to tell. 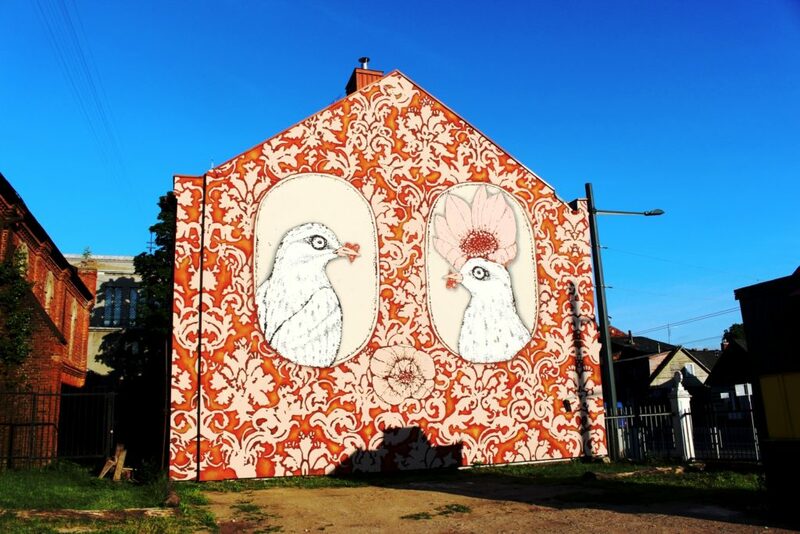 The mural has been completed during Kaunas Art Biennial TEXTILE’07, when Margarida Kanciukaitis, the mother of street artists, was invited to exhibit her crafts, while the her sons received an invitation to paint a mural on the gallery’s façade. Experiences and impressions that inspired the artists during their trip through Lithuania have been immortalised in this mural. This project did not have any predetermined vision or idea and was carried out spontaneously; it is a fantasy and visualisation of dreams that combine the elements of Brazilian culture and images from Lithuania. The colour yellow dominating in this work creates a wonderful contrast to the grey building and Lithuanian winter sky. Os Gemeos belong to the famous street artists in the world – everyone street art fancier in Berlin and abroad loves their walls. Os Gemeos are two world-renowned brothers from Brazil Gustavo and Otavio Pandolfo. As children, they developed a distinct way of playing and communicating through artistic language. With the encouragement of their family and the introduction of hip hop culture in Brazil in the 1980s, the twins found a direct connection and a way to communicate their inner world to the public. Together they explored the various techniques of painting, drawing and sculpture, and had the streets and their objects as their canvases. 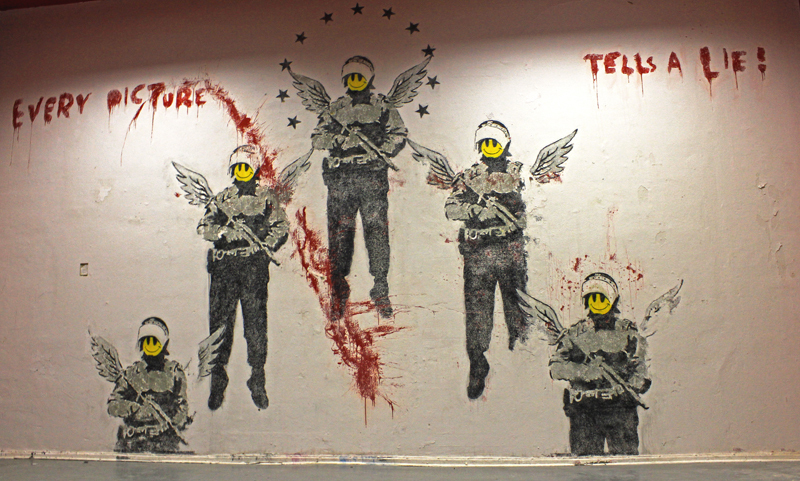 Through their murals, the artists address political, social and wealth inequality issues. The mother of brothers, Margarida Leda Kanciukaitis, was born in a family of a Lithuanian father and a Brazilian mother; therefore, for them Lithuania is an undiscovered yet a familiar country. This what you read was a very small impression of the street art and the murals you find in Kaunas. Many special THANKS to Goda Skeryte from NYKOKA, who showed us all the interesting places and provided textes about the murals and the artists. But this is it not yet! We will publish soon an article about VYTENIS JAKAS -one of the most impressing artists in Kaunas and his very special „gallery“. Further you need to know a guy called MORFAI who plays with the urban enviroment like nobody else. Let´s stay in touch! We will come back soon!